which helps smoothing out the video you shoot from your quadcopter. A video shot with a gimbal will have no jello and will be extremely smooth. Gimbals come in all shapes and sizes, and can cost anything between $50 to$300 and up. To put it simply, a gimbal counteracts the quadcopters rotation by rotating the camera in the opposite direction. For this to work the gimbal has 2 or 3 axis around which it can rotate the camera. Gimbals use either simple servos or brushless motors for the rotation. Just like quadcopters, gimbals get their information from the gyros built into the gimbal controller. There are simple vibration dampening mounts on the market which call themselves a gimbal (for example this one from GoolRC). While these are not gimbals, they are still good at reducing the jello, the jelly-like effect of your videos. Most gimbals can be controlled from the transmitter too, and you should be able to hook up them to your FPV goggle’s tilt and yaw sensor through the transmitter’s trainer port. While the gimbals are usually too heavy for FPVracing (check this pan-and-tilt solution for FPV), they are still great to look around when the quad is up in the sky. A gimbal’s performance improves as you move from servo-based gimbal to a brushless motor based one, then move on from using two axis to using three axis. are good for basic aerial photography and FPV flying. While these gimbals do not offer high performance, they are cheap, and most flight controllers support them out ofthe box, so no additional controller is needed. The gimbals can work as pan-and-tilt systems for FPV flying too. There are quite a few videos on youtube on setting up the flight controller and the gimbal – for a basic guide check out this one.You can find servo gimbals on Amazon, click here for the price. To control these gimbals from your transmitter, you can either directly connect the servos to the receiver without stabilization, or use your flight controller’s built-in gimbal support. For more information check this reddit discussion and the Cleanflight mixer documentation. are intermediate level solutions with better performance than the servo based gimbals. These gimbals use a special gimbal controller to drive the brushless motors smoothly, using softer signals than what the motor controller for the propellers use. The gimbal controllers have an external sensor board which moves together with the camera, so the feedback is very accurate. As the outrunner motors have a huge torque, smooth movements are a non-issue for these setups. are professional systems for very high quality aerial photography. As these gimbals have one more motor and one more axis so they can compensate for the quadcopter’s yaw too. Compared to the 2axis systems they weigh a bit more, so getting extra batteries for your quadrotor drone is a great idea. For best results choose a gimbal designed for your camera. This way you will not have to care about balancing the gimbal (it should not rotate under the camera’s weight), nor PID tuning, as the manufacturer has already done these for you. Controlling a brushless gimbal from your transmittter is possible too,you will have to connect the output from the receiver to the gimbal controller, and set up the gimbal controller to properly use the input. Which gimbal to choose for your quad? When choosing a gimbal for your quadcopter, keep it simple first. If you are just starting out with gimbals, a simple 2 axis unit is more than enough. Choose a gimbal that’s designed for your camera, so you can skip balancing and PID tuning. Servo based gimbals are only good for basic photography, and will require a deep dive into your flight controller software, so just get a 2 axis brushless gimbal. are the cheapest, they do not require PID tuning, and can work even when a bit imbalanced. Getting the basics to work is easy with these gimbals. However you will need a deep understanding of your flight controller software to control these from your transmitter while the flight controller takes care of the balancing. This gimbal comes without servos and camera, and weighs 72 grams. 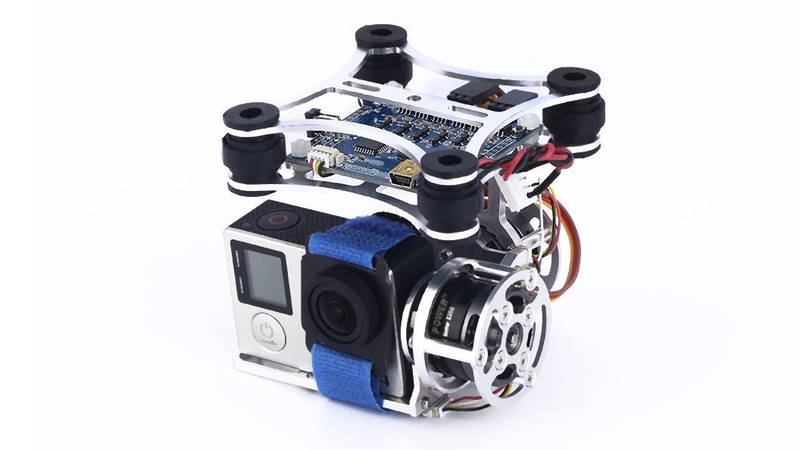 is a great entry-level brushless quadcopter gimbal. It was designed for the Gopro Hero 3 / iLookseries of action cams. The gimbal supports pan and tilt control from your transmitter with a software upgrade, hooking it up to an FPV goggle’s sensor is possible too. It’s recommended for beginners and is priced very competitively. The Walkera plastic gimbal weighs 136 grams, you can drive it directly from your 3S Lipo battery. is another great brushless gimbal from Walkera. Compared to Walkera’s 2-axis plastic gimbal it offers more stability as it can compensate for the quadcopter’s yaw movement too. The Walkera G-3D is compatible with the Gopro 3 and iLook action cameras, and can tilt and roll based on input from the receiver. It works directly from a 3S Lipo, all you have to do is power it up. Weight is 188 grams, and transmitter control is supported too. is a high-performance 3 axis gimbal designed for the DJI Phantom 2 and the GoPro Hero4 Blackaction cam. This gimbal is only compatible with the Hero4 Black, and will become imbalanced with other cameras, so use it only with a Hero4 without filters. While the gimbal was designed for the Phantom 2 it’s usable with other quadcopters too, if you get the gimbal control unit for it. The gimbal weighs 167 grams, and theGoPro is 87 grams, you will need a 350 size or larger quad to lift it.You can use your 3S Lipo as power source for the GCU, the GCU supports tilt angle control from the transmitter. Choose this if you are looking for a professional solution. is another great brushless gimbal. It supports Hero 3, 3+ and Hero 4 action cams and has a both an FPV mode for simply smoothing out the video, and another mode to tilt and roll it from your transmitter. This is a good alternative to the DJI Zenmuse.The gimbal weighs 178 grams, and you can simply hook it up to your drone’s battery. is possible too. There are quite a few gimbal controllers, gimbal motors and frames on the market today, so you can just build your own if you enjoy putting things together. There are even gimbal controllers which support automatic PID tuning, for example the BaseCam SimpleBGC controller, so you’ll only have to do the building and the balancing. Other systems you may want to checkout are the EvvGC and the Virtual Robotix gimbal. You can also get gimbal motors and controllers on Amazon too. The Holy Stone HS110W is a high quality FPV quadcopter from Holy Stone, which has more extras than you could think of. The HS110W is available in black and green. 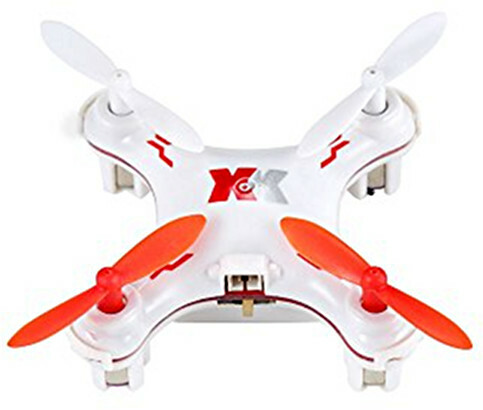 The quadcopter has the standard 6 axis gyro stabilization, LEDs for easier orientation, on board camera, headless mode, air-pressure based altitude hold, automatic takeoff and landing, one-button flips, and it can be controlled from a smartphone too. The Holy Stone HS110W not only looks good, but is well built too. It can take crashes like a champ as tiny screws hold it together, not the usual plastic clips. Still for best results fly only above soft surfaces. It has legs for smooth landing, and prop guards to protect the props would the quadrotor crash. The drone comes complete with replacement props. Replacement batteries with charger and replacement motors are available too. Other parts (props, guards, legs) seem to be out of stock now. The Holy Stone HS110W is very stable in the air – you can just put the transmitter aside and it will stay planted, which is a unique feature in this price category. The mini drone is 32 centimeters x 32 centimeters in size, and weighs a bit more than 100 grams. As such it can’t lift much weight, but will happily lift a 808 keychain camera if you lighten up things a bit. FAA registration is not required for drones this light. The quadcopter supports both indoor and outdoor flying, and has 4sensitivity modes which not only helps with adapting the quadcopter to beginner and expert pilots, but makes indoor and outdoor modes possible too.Low (beginner) modes are better for indoor flying, while high (expert) modes are better for outdoor flying. Still, the HS110W really shines outdoors due to its size, power and range.It can fly up to a 100 meters away, and can fly just as high too. The mini drone’s propellers are gear driven, the motors are the brushed coreless type – standard for every quadcopter in this class. The HS110W is fairly quiet, so you will not disturb anyone with it. The range for the transmitter is 100 to 120 meters, while the video range is about 30 to 50 meters. As the mini-drone uses the 2.4 Ghz spread-spectrum technology, it will simply shut down if it goes out of range. The suggested age for the quadcopter is 14 years and up. The kit contains tiny parts, so keep it out of the reach of little children. The HS110W has a wide range of features including headless mode and one key return: in headless mode the forward-backward-left-right stick movements will be interpreted with respect to the quadcopter’s power-on orientation. So if you powered on the quadcopter while it was looking forwards away from you, using the back stick will bring it back to you in headless mode. The quad also has one-key landing and liftoff, which is a nice convenience feature. It features altitude hold too, so it will stay planted in the air. The box contains everything for flying, except for the 4xAA batteries for the transmitter. A smartphone is required only for the camera functions -you can fly without it, but will not be able to record videos or take photos. The package size is 45 cm X 28 cm X 10 cm. is a 3.7 Volt, 650mAh LiPo battery, built into the quadcopter. The charge time is 60 minutes, flight time is 7 to 9 minutes. With a replacement battery and charger or a USB power bank you can get even more fun out of this quadcopter. The stock charger is USB based, and connects directly to the quadcopter.It’s easy to charge the HS110W: just plug the quadcopter into the charger,and the charger into a USB socket. It’s compatible with iPhone chargers too. The quadrotor has low voltage protection, it’s LEDs will start flashing if the battery is running low. Land as soon as possible if you see this. of the HS110W is a 1280×720 pixel unit. It can record videos and take photos both to the internal 4GB MicroSD card(included in the package), and it can send the video signal via WiFi to a smartphone. The video quality is average, and the WiFi based FPV has a distinct lag, so all in all it’s a fairly standard quadcopter camera. Using a smartphone for the video functionality is great because you can actually see what you are recording. The package includes a smartphone clip too, which attaches to the transmitter’s antenna. The videos are recorded as plain .AVI files so all players can play it. For best results always stop the recording before powering off the quadcopter, or the files could get damaged. The camera is fixed in place, and looks forward, so adjusting it is not possible. While the smartphone app can in theory control the quadcopter, in reality it does not work so well. So use the transmitter to control the quadcopter, and the smartphone to control the video functionality. The app supports live viewing, taking photos and starting/stopping video recording. The quadcopter supports both Android smartphones and iPhones. To use the video functionality first download the android app from Google Play, or the iOS app from iTunes. Next start the quadcopter and bind it to the transmitter. Search for a WiFi hotspot with FPV in the name, and connect to it. Next start the smartphone app. The app has buttons for taking photos and starting/stopping the video. For the smartphone-based recording to work, the smartphone has to stay on WiFi, which has a 30 to 50 meters range. Cellular data is not suitable for this purpose. Replacement camera exactly for this quadcopter is not available, however a wide range of WiFi FPV cameras are available on Amazon. is a full sized unit, with a great looking LED-backlit LCD. It uses the interference-free 2.4Ghz technology, so you can fly together with other quadcopters without any issues. Just make sure you bind the quadcopters and the transmitters one-by-one. The transmitter is mode 2 only, with the throttle stick on the left. Binding the quadcopter and the transmitter is simple, all you have to do is turn both off, and set the throttle to the minimum. Next turn on the quadcopter, then the transmitter, and push the throttle up to the maximum and down to the minimum again. The transmitter has a button for gyro recalibration, so if the quad is drifting (happens after a crash), just place it on a level surface and press the calibration button. Takeoff and landing are supported by their appropriate buttons. the Holy Stone HS110W is one of the best quadcopters in it’s class – it has a wide range of functions, flies really well, and looks good too. 6 stars if that would be possible. If you liked the Holy Stone HS110W you will probably like the Akaso X5C and the Syma X5SW too. There is a nice review of the HS110W over at Youtube, and the Amazon Reviewsare very helpful. The Ionic 6 Axis Mini Quadcopter is a tiny but tough quadcopter from Ionic. It has everything you can expect from such a tiny drone: it has prop guards out of the box, bright LED lights, a 6-axisstabilization system and can do flips on button press. 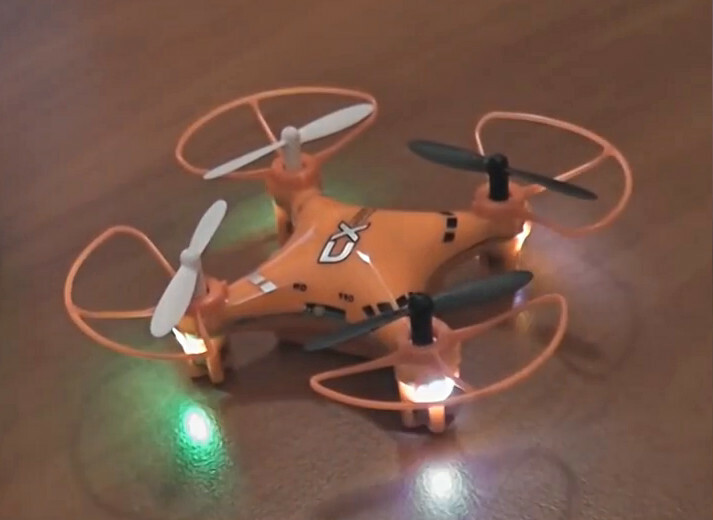 The Ionic mini-quadcopter is available in three colors: orange, green and white. Range is around 30 meters, and flight time is around 6 to 8 minutes, which are respectable. The mini-quad uses the 2.4 Ghz technology, so it will simply drop out of the sky if it goes out of range. The box contains everything for flying, except for the 2xAA batteries for the transmitter. The Ionic mini quadcopter weighs only 15 grams and is about 7.5 x 7.5centimeters in size. Still it’s suitable for both indoor and outdoor flying,and will take small gusts like a champ. FAA registration is not required for the Ionic mini quadcopter, which is a plus. The quadrotor is very stable in the air, so you will not have to keep adjusting it. The transmitter has trim buttons which can come handy would the quad start drifting. The mini quad comes with 4 replacement propellers, however parts are a bit harder to find than for the Cheerson CX-10 for example. Being a tiny quad it will not be able to lift anything substantial. The Ionic 6-axis mini quad has beginner and expert modes, which make indoor and outdoor flying easier too – beginner mode is better for closed spaces,while expert mode is better to fight the wind outdoors. The suggested age group is 14 years and up, however younger children can fly it well too. As the quad contains tiny parts, keep it out of the reach of little children. As other quadcopters in this size- and price-range, the Ionic mini quadcopter is bare-bones, it does not have a GPS, headless mode, or one key return. For such functions you may want to check bit larger models, like the Holy Stone HS170. The motors of the Ionic 6-axis mini quadcopter are the brushed coreless type, so they can spin up and down really fast. The shipping weight is around 200 grams, the box size is 20cm x 15cm x 7cm. The Ionic mini quadcopter’s bright LED lights make night flying fun. It’s quiet too, so you will not wake the neighbors with it. of the Ionic 6-axis mini-quadcopter is a single-cell 3.7 volt Li-Po battery, with 150mAh capacity, which is not removable. The battery grants the Ionic mini quad a 6 to 8 minute flight time after a100 minute charge time. The datasheet states that the battery is a 500mAh unit, however this isnot the case – you could not even fit such a large battery into the quadcopter. The charger is an USB based charger. To charge the quadcopter, first connectthe quadcopter to the charger, next the charger to an USB port. Wait for thered LED in the charger to turn on, and you are ready to go. The quad has low-voltage protection, and it’s LEDs will start blinking once it’s battery is running low. If you see this, land as soon as possible to avoid crashing it. Charging the battery is possible using any USB socket, including the iPhone or Android chargers, or USB power banks. While official replacement chargers are not available, other mini chargers like this one for the Syma X12 or this for the JJRC H20 could work. Then again it could be easier to just get a Syma X12 which is better supported. of the Ionic 6-axis is a game controller-like small sized transmitter. As such it’s a bit more suited to small hands. The mini-quadcopter uses the 2.4 Ghz technology, which is interference free.This means that you will be able to fly together with others. 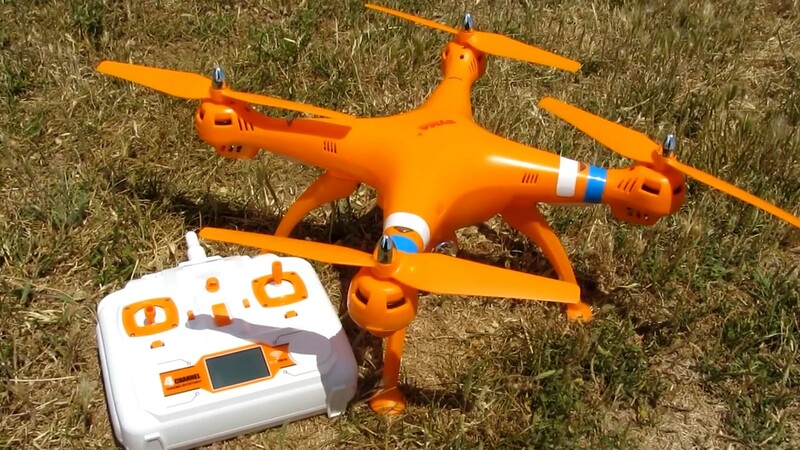 Also the colors of the mini-quad do not code it’s frequency, they all run on 2.4Ghz.The transmitter is part of the package, and is needed to control the quadcopter – you can’t control it from a smartphone. The range of the transmitter is 30 meters. Would you go out of range the quadcopter will shut down and crash, so take care. Fly only above soft surfaces if you want to find the limit. The quadcopter is not available without a transmitter, and it will not bind to other transmitters either. The transmitter is fixed in mode 2, with the throttle on the left stick. To bind the quadcopter and the transmitter, first turn them off, place the quadcopter on an even surface, and set the throttle to minimum. Next turn on the quadcopter, then the transmitter, and push the throttle to the maximum, and then back to the minimum again. To enter the flip mode depress the right stick. Pushing the right stick again will stop the flip mode. In flip mode the mini quadcopter will flip towards the direction of the right stick. Depressing the left stick switches between low (beginner) and high (advanced)mode. If you trimmed the transmitter, but would like to reset it, all you have to do is press the “R” and “B” trim buttons together. the Ionic 6-axis mini quad looks good, flies well,however the support is a bit lacking. But hey, it’s just a toy, so you can’t really go wrong with it. The Cheerson CX-10 and the Estes 4606 are booth very good nano-quadcopters, the Cheerson CX-10is very well supported too. The Blade Nano Qx is an absolutely tiny quadcopter weighing only 16 grams.It is great for indoor flight, and can tolerate small (10-20 mph) winds outdoors too. It’s high quality and very robust, it has crash- and prop guards for protection, and being light means it can’t crash hard. The Qx has two version, this is the non-FPV one. So this is a simple quad,without special needs as a smartphone for the video functions. Being very small (only 5.5 x 5.5 x 1.97 inches) this quad is a really quiet! Even though being small, the Blade Nano Qx has a very respectable 7 minute flight time and a 25 minute charge time and comes with a single battery. To extend the fun you can buy additional batteries, for example on Amazon. The Blade Nano Qx has a simple USB based charger, the battery pops right into it. As such it does not have a charging cable, and you will need an USB outlet or a computer to charge it. Replacement chargers are available,for example the one in the picture. The charger supports only a single battery, but you can easily get multiple chargers. Charging is super easy: just plug the charger into an USB port, pop in the battery, and wait ~25 minutes for the red LED to turn off. During flight if your battery is getting low, the led will start blinking. You should land as soon as possible to avoid damage to your quad. The Blade Nano Qx has both an agility and a stability mode; these two modes take the place of gyro sensitivity setting. Stability mode is better for beginners while agility mode is better for advanced fliers. In agility mode this can even do flips! As the Blade Nano Qx is an an entry level quadcopter it does not have a GPS for position hold or return home function (it would not work indoors anyway), but stays planted in the air thanks to it’s powerful sensors. The quad is powered by brushed motors,which is the standard solutions for these small machines. Replacement motors are available both in clockwise and counter-clockwise variants.Upgrades are available too, for a more aggressive flight you can get faster motors complete with wiring and plugs (just make sure you exchange them one by one, so you do not mix up the motor’s directions). To increase the flight time you can upgrade the battery too. Be careful though, the motor upgrade will turn your Blade Nano Qx into a hard-to-control speed demon. needs 4xAA batteries which are not always included in thepackage. You can use it in both mode 1 and mode 2. As the Blade Nano uses2.4 ghz transmitter technology, it is compatible with other Txes too.Changing the Tx is a good idea to extend the default 60 feet range. Forgroup flying the 2.4 Ghz technology guarantees that you will not getinterference, so they make a great gift for friends. disconnect the flight battery from the quadcopter. select an empty model memory on your transmitter if multiple models are supported. clear servo reversing, trims, set throttle to low/off and power off the transmitter. connect the quad’s battery. Wait ~ 5 seconds for the blue LED to flash. the quad is bound when the blue led turns solid. Quadcopters this small do not need to be registered. If you suffer a crash, replacement parts are readily available for example here. The suggested age is 14 years and above. The quad comes without LEDs, which might impact night flying. The shipping dimensions are 14.1 x 8.4 x 4.5 inches , 1.2 pounds – handy to know if you plan to travel with it. Due to the quad’s agility, fun factor and overall value it deserves the highest rating.You might want to check the rating on Amazon too for more information. The Syma X8C Venture is a large sized quadcopter, weighing in at a bit more than 600 grams. Not only the weight, but the size is impressive too, the quadcopters measures 50 x 50 x 15 centimeters with the prop guards on. Motor-to-motor size is around 30 x 30 centimeters. The X8Ccomes with everything needed for flying, except for the 4xAA batteries for the transmitter. Due to it’s large size the X8C Venture is very stable, only strong winds will disturb it, so it’s suitable for beginner pilots too. The brushed motors provide adequate power, and the transmitter has low and high rates (that is, beginner and advanced modes), which makes the X8Ceven more adaptable. The overall quality is really high, even though it may not be visible at the first glance. The X8C can even do flips, and is great for aerial photography due to it’s stability. Yaw rate is a bit low, but this problem is inherent to the quadrotor design – tricopters with a servo-controlled tail have a much better yaw rate. The range of the X8C Venture is up to 250 meters, there is no limit on how high can it fly, so it will go up and up until it gets out of range. As theX8C uses the 2.4Ghz transmitter technology it will simply shut down once it’s out of range, so be careful with it. 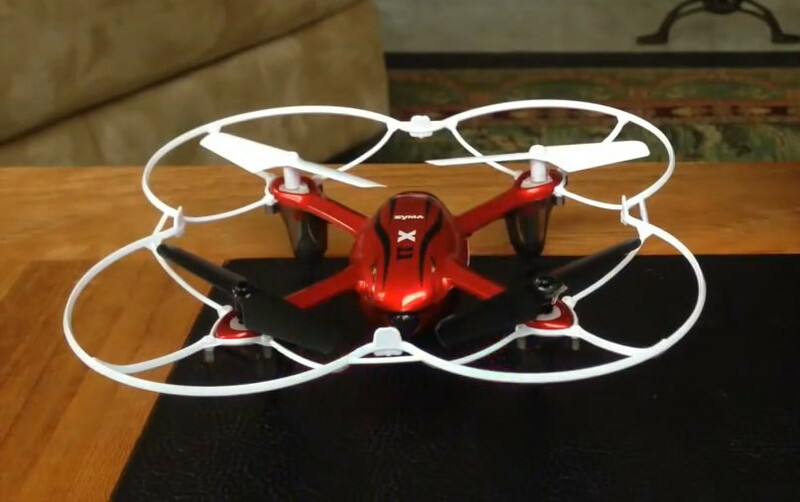 The X8C is very durable, and comes with prop guards and legs out of the box. Still, a 600 gram quad is no toy, and can crash pretty hard so take care.The prop guards are a bit brittle, it can be a good idea to stock up on them. Replacement parts are readily available, for example legs and prop guards, motors and complete sets are available too. Being a large quadcopter it can lift considerable weight, so lifting a GoPRO is a possibility provided you can fit it.For best results remove everything you do not need: the prop guards and the original camera. The transmitter does not support additional servos, so you will not be able to move/rotate the extra camera around. The quadcopter can fly both indoors and outdoors, however indoor flight is very limited due to it’s size. On the other hand it really shines outdoors, and will fly well even in moderate wind. The X8C venture has LEDs, which make the night flight real fun, and help a bit with daytime orientation too. The suggested age group for the X8C is 14 years and up. The X8C contains small parts, so keep it out of the reach of small children. 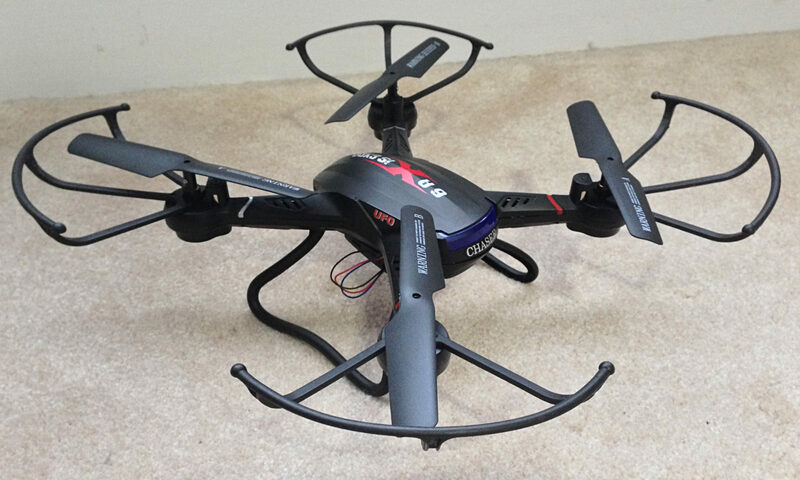 The Syma X8C venture has headless mode, which comes really handy if you lost the orientation of the quadcopter. In headless mode (which can be activated by pressing the top left button on the transmitter for two seconds) theX8C’s controls will change: the forwards-backwards-left-right directions will be interpreted with respect to the X8C’s original direction, so sending the quad backwards will simply make it fly back to you. Return home is not supported. The X8C has “low” and “high” rates, suitable for beginner and advanced pilots respectively. The modes can be toggled by a short press on the top left button of the transmitter. The shipping weight is 1.8 kilograms, and the size is around 35x35x17centimeters. Even though the X8C is large it is surprisingly quiet. The large weight means that this quadcopter must be registered with the FAA. Online registration is possible here. is a 7.4 V 2000 mAh Li-Po battery, which grants the X8C a 7 to 12 minute flight time depending on how you fly it,after a 200 minute charge time. The charge time might seem to be long, the upside is that the battery will not be strained by too fast charging. The X8C comes with a single battery. The charger is a balancing charger, and uses a standard wall socket to charge the 2 cells of the battery. The battery uses a banana plug to connect to the X8C, and a 3-wire balancing plug to connect to the charger. While they may seem special, replacement is readily available, for example a3 battery + charger combo with the possibility to charge all the three batteries at once. Buying multiple batteries is a great way to increase your flight time. The stock charger has two LEDs, a yellow one for the input voltage, and a green one for the charging. When the green LED turns of the battery is fully charged. The X8C has low voltage cutoff, it’s LEDs will start blinking before the battery power runs out. is the same as the X5C’s. It’s a 2 megapixel camera, with an1280x720 resolution, frame rate of the videos is 30 fps. The videos are recorded onto the 4GB MicroSD card which comes with the quadcopter. A card reader is part of the package too. The MicroSD card is inserted into the back of the camera. The camera is not fixed, but is tilt-able in 30 degree increments, which is a bit better than what the average quadrotors offer. Recording and photo taking is controlled on the transmitter, so you will be able to stop and start it mid-flight, no more fiddling on the quadrotor. To start and stop the video, push the button right of the left stick down.To take a photo push it up. It’s important to stop the recording before powering off the quadcopter,otherwise the files could get damaged. The video files are stored in .AVI format, so pretty much any video player will play it. Audio is recorded too, however it can be too noisy to be useful. 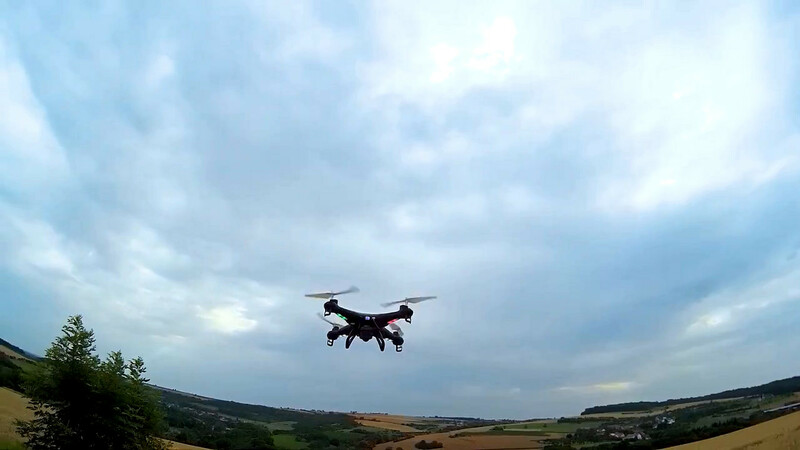 As the X8C is not an FPV quadcopter, a smartphone is not required for the flying, and there is no live video feed. The X8C is fairly strong, and once you remove the original camera it can easily lift a GoPRO or one of it’s clones. The photo and video quality is as good as you can expect from 2 megapixels. For an advanced setup you may want to check out this gimbalor this vibration damper(needs fitting for the X8C). is a lightweight, 2.4 Ghz unit which looks like the professional transmitters, except for the white color. It’s interference-free, so you will be able to fly with others together. The X8Cis available as a minimal package too, without charger, transmitter and camera here. Even though the X8C uses the 2.4Ghz frequency, the protocol is proprietary,so in general you will not be able to bind it to other transmitters. One exception is the DeviationFirmware, available for the Walkera Devo transmitters, which could work, but requires tinkering with the transmitter. The stock transmitter supports only mode 2 and mode 4. Mode 1 is notsupported. Turn off both the quadcopter and the transmitter. Push the throttle (left stick) to the minimum and power on the transmitter. Next push the throttle up to the maximum, then down to the minimum again. The quadrotor and the transmitter are now bound. To recalibrate the gyros, place the X8C on an even surface, and push both sticks to the lower right corner. Once the X8C’s LEDs start flashing, recalibration is complete. The X8C is great platform for aerial photography, feels planted in the air. The only downside is that it’s not as sporty as it could be. RCGroups has even more details on the X8C here and here. Plans for a 3D-printed Gopro mount is available here, the manual is hereand there is a brushless upgrade kit too. Syma has other quadcopters for aerial photography, for example the X5C and the X5SC. If you are looking for something more sporty, you the Holy Stone F180Ccould be your friend. We do not collect any Personally Identifiable Information from visitors of our site, apart from the visitor’s IP address. The visiting IP address and browser type is collected and retained for one year. This data is used for website performance monitoring, and is not sold or given to a third party. Cookies are used on quadcoptero.com. Cookies are small files that a site or its service provider transfers to your computer’s hard drive through your Web browser (if you allow so). Cookies enable the site’s or service provider’s systems to recognize your browser and capture and remember certain information. Cookies are used to help us understand your preferences and to compile aggregate data about site traffic, which in turn enables us to provide you with improved services. We use Google Analytics a trusted third party services, to track this information on our behalf. Disabling cookies in your browser will not affect the service you receive from quadcoptero.com. We do not sell, trade, or otherwise transfer to outside parties your personally identifiableinformation. We may only release your information when we believe release is appropriate to comply with the law,to enforce our site policies, or to protect ours or others’ rights, property, or safety. Aggregated, non-personally identifiable visitor information may be provided to other parties for marketing, advertising, or other uses. We use links to third party products, services or websites. These third party sites have separate and independent privacy policies. We therefore have no responsibility or liability for the content and activities of these linked sites. Nonetheless, we seek to protect the integrity of our site and welcome any feedback about these sites. We do not specifically market to children under 13. Our products are not of interest for children under 13, and aren’t harmful to them either.